This second episode of Inkaar gave further insight into the main characters. Hajra’s character is intriguing, her thoughts are interesting and her track has a really gloomy feel to it. While on the one hand her thoughts are rather unconventional, on the other hand she was also shown worrying about her reputation. Some of the scenes in this episode were somewhat preachy and the screenplay was different but at times not engaging enough. Shayan’s determination to win Hajra over so that he could make her smile again was shown through different scenes in this episode. Shayan thought he was showing Hajra how much he loved her but Hajra felt uncomfortable around him. The dialogues about how a man can harass a woman just by his presence were quite interesting. These dialogues nicely summed up how Hajra felt while Shayan was around. We still don’t know what happened in Hajra’s past but it is quite evident that her thoughts are largely influenced by her past experiences. The screenplay reminds me of Muqabil because it makes the viewers constantly wonder what the backstory is. The leading lady’s thoughts and actions are determined by bitter experiences of the past and now there is a new man in her life who is willing to accept her for who she is. Shayan’s sketch of Hajra and his message clearly suggested that Hajra was a very different person before all of this happened. Hajra’s conversations with her friend give an insight into her thoughts but these conversations would have been so much more relatable if we actually got to see who this friend was! By the end of this episode Shayan and Hajra both left their jobs. 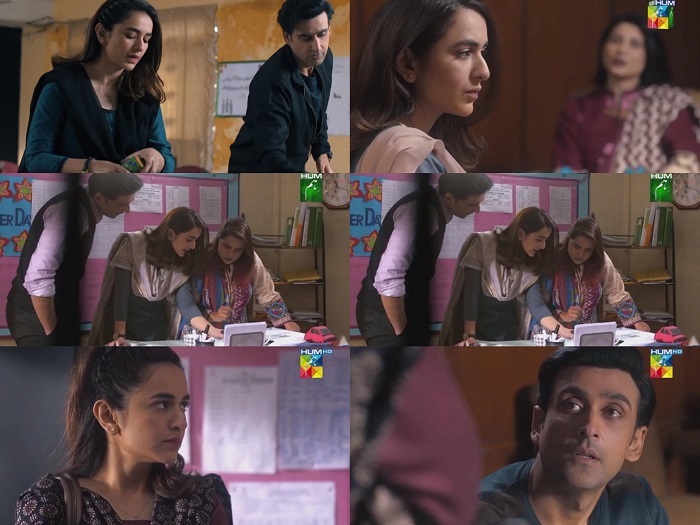 When Hajra came back home she was not upset because she felt for Shayan but she was more concerned about how this incident made her exit from the school awkward. The only person Hajra listens to and wants to please is her father. 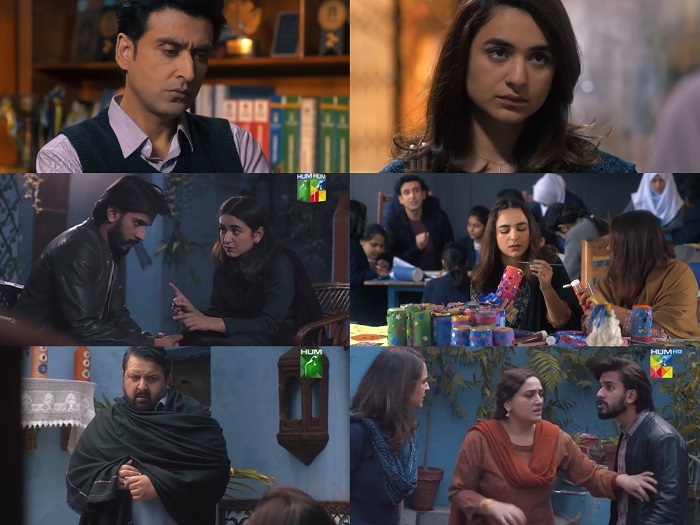 By the end of this episode, her father made a decision which will change everything for Hajra. Will she end up getting married to man she does not even feel sorry for? Shayan’s role so far has nothing new to offer, it is a lot like many other characters Sami Khan has played in the past as well. So far, I haven’t warmed up to Shayan at all and I don’t find myself rooting for him. This drama so far has an old and gloomy feel to it. Sami Khan’s makeover is turning out to be a major distraction. The good boy hairstyle and clean shave look does not look good on him. The grey foundation coupled with those black spots on his scalp (some kind of a hair treatment?) are also distracting. Sami Khan needed to look younger for this role but he actually looks too mature for it. Yumna Zaidi has played her role well and so far Hajra’s character is intriguing. Imran Ashraf will finally make an appearance in the next episode. The preview of the next episode also suggested that we might get to watch what happened in the past. Do share your thoughts about this episode of Inkaar.